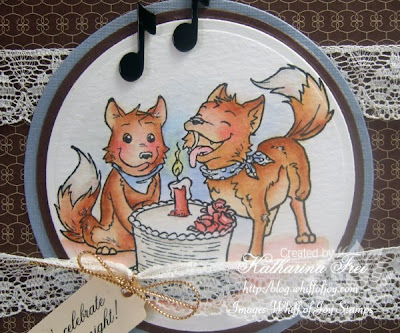 Aren't those two foxes, designed by Alison Acton for Whiff of Joy Stamps, perfect for a "love" card?? I instantly had the song "Tonight I Celebrate My Love To You" from Sharon Cuneta on my mind. I did the scalloped border with the new SU punch and used the coordinating stamp set with chocolate chip ink. The sentiment is created on the computer. Sind diese beiden Füchse, designed von Alison Acton für Whiff of Joy Stamps, nicht perfekt für eine "Liebes" Karte? ich hatte sofort den song von Sharon Cuneta im Ohr "Tonight I Celebrate My Love To You". Den Text habe ich dann am Computer erstellt. Den Rand habe ich mit dem neuen scalloped border punch von Stampin' Up gemacht und das passende Stempelset dazu verwendet. the colours are fab, those papers look yummie! Total goldig. Und der Sketch ist auch große Klasse. Habe mein Kärtchen für den Challenge auch heute mittag fertiggestellt*g.
Katharina, this is gorgeous! I love the sentiment as well and the notes at the top just add a little more to an already great card. I am so thankful to have found a link to your blog, its totally awesome. Your cards are magnificent. I need to get some decent stamps. I have just ordered the kit as I realised I will be away when the giveaway happens, so I want to make sure I get the kit either way. Looks like a really fun sketch! I will try to play along with weekend. This week has been soooo busy! And I am out the door again in a few seconds. This card is awesome...I love your coloring. Love your card with the lace! Gorgeous! 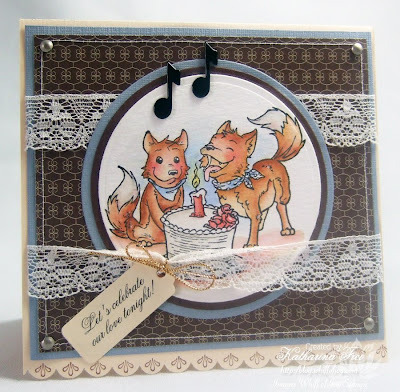 Gorgeous card, love the image those foxes are so cute. Love the lace it look gorgeous. Such pretty cards and colured so beautifully!!! 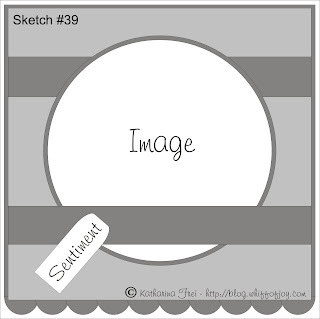 katharina I love your sketch and it is definitely one i will try....love your card and what great inspiration!!! Katharina what a gorgeous card and a super fun sketch! I can't wait to play along with it tomorrow! Fab card - love the colours! Thanks for a great sketch too! What a great sketch and great card! here's mine that I made!